WELLINGTON, Fla. – April 25, 2017 – In an epic rematch of the 2015 U.S. Open Polo Championship® final, Valiente defeated Orchard Hill 13-12 in overtime at the International Polo Club Palm Beach (IPC).Valiente was striving for the Triple Crown after winning the C.V. Whitney Cup and USPA Gold Cup® earlier this year, while Orchard Hill was looking for back-to-back U.S. Open titles. The previous match-up between these two teams was a thrilling overtime affair that resulted in a Valiente comeback, but Orchard Hill was looking for a different outcome this time around. The final was exciting from the second the ball left the umpire’s hand to begin the game. Orchard Hill’s Polito Pieres took the throw-in and found Facundo Pieres on the end of a pass. Facundo bounced a shot in off the goal post to open the scoring less than 30 seconds into the game. 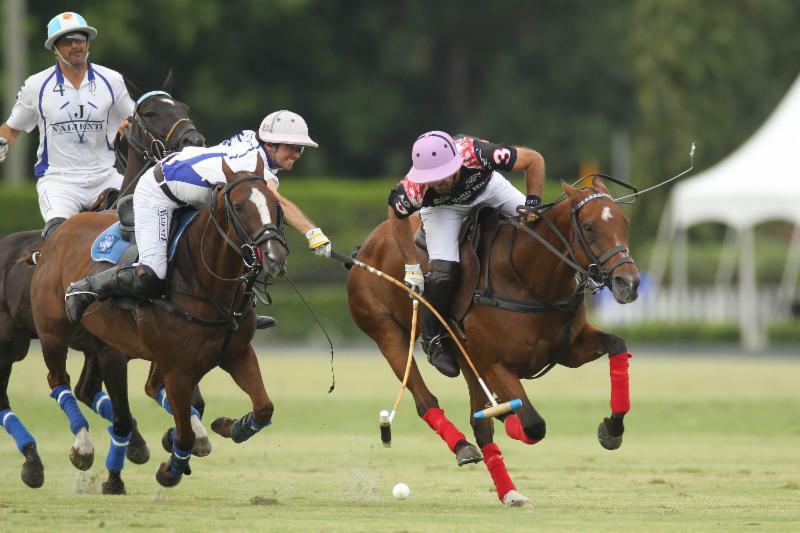 After both teams traded penalty goals with Facundo converting a penalty 4 for Orchard Hill and Diego Cavanagh converting a penalty 2 for Valiente, 10-goaler Adolfo Cambiaso drove downfield with time expiring. Shooting at goal from approximately 60 yards out, the ball sailed over the inside edge of the goal post, narrowly missing a goal by inches. The smallest of margins was determining the outcome of the game between two highly skilled and well-mounted teams. The tense game continued as Diego Cavanagh took advantage of early fouls from Orchard Hill to score the first 5 Valiente goals (4 penalty goals, 1 field goal). Meanwhile Orchard Hill was controlling open play as Polito Pieres scored his first goal of the game while Facundo Pieres scored his third goal to maintain the 4-4 tie after two chukkers. Orchard Hill exploded in the third chukker, outscoring Valiente 5-2. Orchard Hill converted 5 of 7 shot attempts as they looked to seize control of the game and gain a lead over a tough Valiente team that was set on making a comeback. 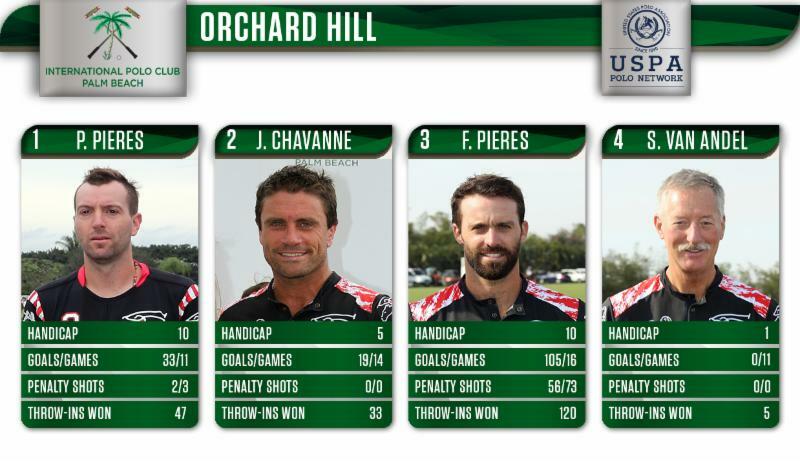 The emergence of Polito Pieres for Orchard Hill was a huge factor. He had his best game of the season, highlighted by a first half that saw him score 4 of his 6 goals and win 6 of his game-leading 11 throw-ins on the day to give Orchard Hill a 9-6 edge heading into halftime. Valiente showed why they were the highest-scoring team of the 2017 season to start the second half as Cambiaso scored off the first throw-in to cut the deficit to two goals. Cambiaso wasn’t done there, as Matias Torres Zavaleta hit a perfect backhand to set him up for a breakaway and put a lot of pressure on Orchard Hill as their 3-goal lead quickly shrunk to 1 goal. Just as it seemed Valiente would keep scoring, Polito Pieres snuck up behind Cambiaso and stole the ball, springing himself on a breakaway to give some momentum back to Orchard Hill. 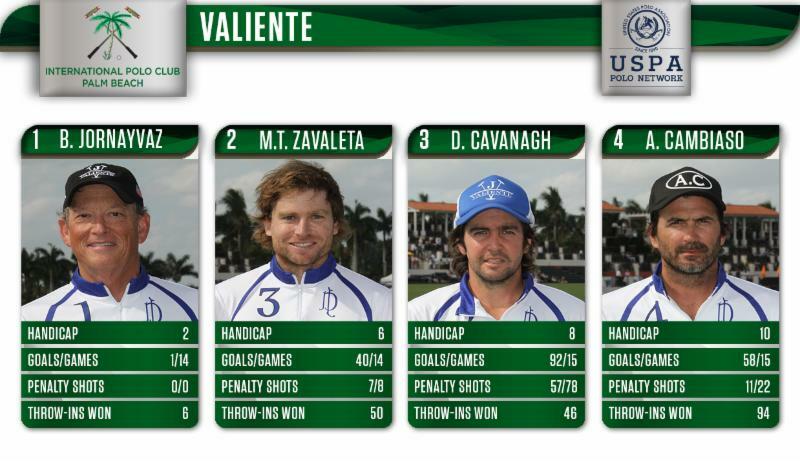 However, Valiente hit their stride and won the fifth chukker 2-0 to tie the game at 11. After Cambiaso gave Valiente their first lead of the game with his fifth goal of the game,Cavanagh had a penalty 3 opportunity to extend the lead to 2 with less than three minutes remaining. Surprisingly, he did not convert, a rare miss for the 73% penalty shooter. Polito Pieres answered by taking a Facundo backhand and hit a cut shot from 40 yards out that just found its way inside the goal post to tie the game.Seconds before the final horn Facundo Pieres caught Cavanagh on a turn near the Valiente goal. After a reversed call and a challenge, Orchard Hill had a penalty 4 opportunity. The ball sailed over the goalpost just wide, throwing the game into overtime. 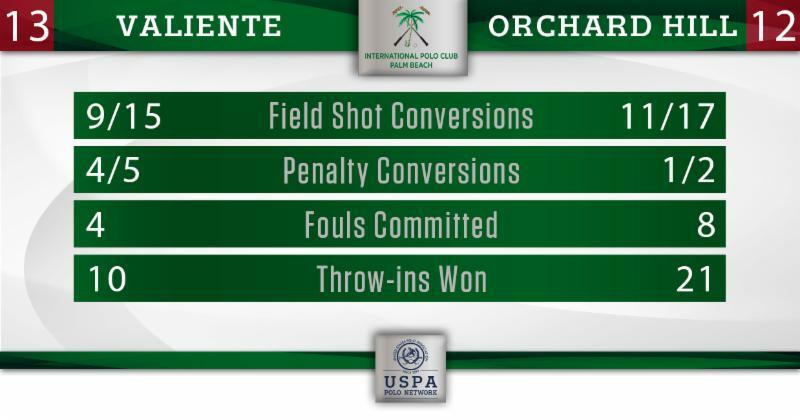 After six chukkers Orchard Hill had shot a very efficient 11 of 15 (73%) from the field, while winning the throw-in battle 20-9, possibly giving them a slight edge heading into overtime. Both teams had their chances to end the game, with Facundo and Polito Pieres both making runs at goal for Orchard Hill while Cambiaso missed a goal by inches on a shot from 40 yards out. 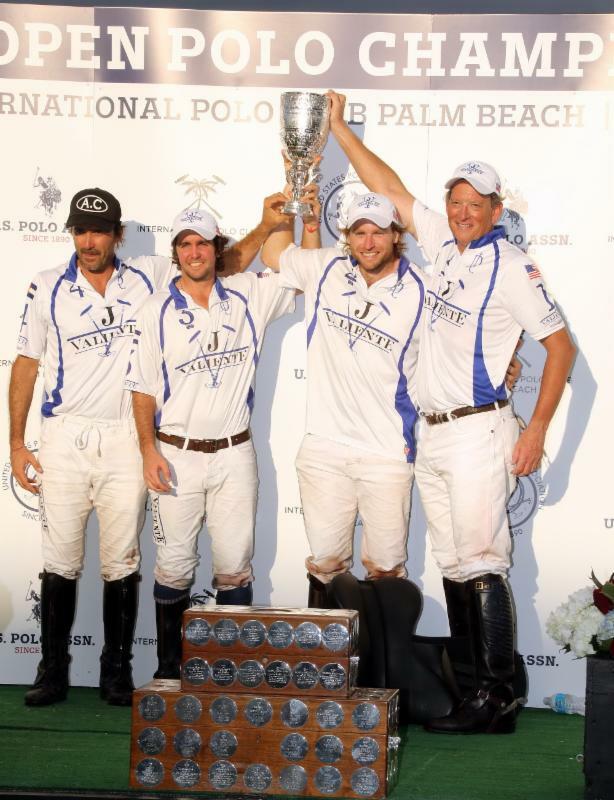 After the ball went out of play approximately 100 yards from the Orchard Hill goal, Cavanagh broke out of the back end of the line-up and ran to goal, putting the ball through for his seventh goal of the game to hand Valiente the 13-12 victory and the 2017 U.S. Open Polo Championship title. Matias Torres Zavaleta was named MVP. Best Playing Pony of the U.S. Open final was “B09″ (a Cuartetera clone) played by Cambiaso. Horse of the Year was “Los Machitos Jazzita,” played by Facundo Pieres. Best Argentine Bred Pony of the final was “Mentolada,” played by Cambiaso. The 2017 US Open Polo Championship final will be rebroadcast on CBS on April 30 at 2 p.m. ET.